OneBonsai is a Brussels based agency creating Virtual Reality and Augmented Reality experiences. When people experience Virtual Reality for the first time, the most common reaction is awe. Awe towards the current state of the technology, and awe when imagining all the practical uses this technology might hold. Their particularity is our scientific approach to designing and building Virtual Reality applications. They are a team of civil engineers working collaboratively with scientists and specialists in their field. The result is a VR and AR experiences that is as relevant and useful as possible. The applications they are busy working on are destined for use in an array of industries : construction, architecture, firefighting, interior design and healthcare. OneBonsai focuses on “serious” (ie. not games) VR and AR for companies. We have the honor to work with key industry players such as Delhaize, ArcelorMittal, Barco, Euronews, etc..
As key actors of the VR and AR sector, OneBonsai also gives discovery workshops. These workshops give crucial insights into how colleagues in your industry are already implementing VR and AR to make a difference. For those of you that are interested in the backstage of VR and AR, OneBonsai also publishes a large part of their laboratory notes in lab.onebonsai.com. 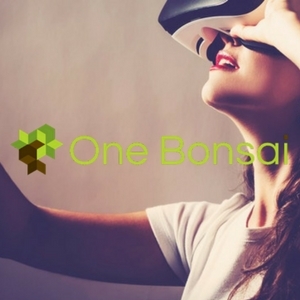 OneBonsai designs and builds Virtual and Augmented Reality and Artificial Intelligence solutions for enterprises.